The Main Series is the ongoing story of Plok's search for a sequel, and his adventures along the way. It is told in one-page epsidoes, and split into Volumes of around 25 episodes each. All episodes can be read for free on this website. Competed Volumes are also collected into book form, which can be purchased in paperback and ebook editions, containing many exclusive extras. 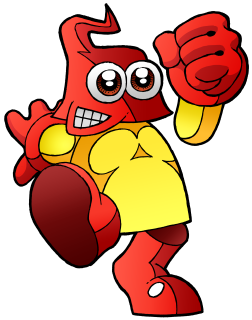 The Plok comic strip begins in 2013, with Plok waking up twenty years after falling asleep at the end of the SNES video game he starred in. » Read episodes #1 to #26. Plok learns more about the modern world of video games, and isn't too happy about what he discovers. » Read episodes #27 to #49. Plok is lured into the cave of his old SNES nemesis the Flea Queen, but things aren't quite as straightforward as they used to be. » Read episodes #50 to #76. Plok is is captured by the Zobian protectors of the Flea Queen, and taken back to System Z to face trial for the crimes he committed in the SNES game. » Read episodes #77 to #101. Plok stands trial in System-Z for the crimes committed against the Skree Queen and her brood in the SNES game. What will the verdict be, and if guilty, what will be Plok's punishment? » Read episodes #102 to #126. Follow Plok's Odyssey as he tries to return home from System-Z, after being banished at the end of his trial. But what's happening back home? » Read episodes #127 onwards.